Glucosamine is an ingredient used in the formation of glycoaminoglycans (GAG’s) and proteoglycans, key components of cartilage tissue. GAG’s and proteoglycans trap and hold water, forming a fluid cushion that provides lubrication and shock absorption. MSM (Methylsulfonylmethane) is a natural source of organic sulfur, necessary for the production of proteoglycans. NOW Glucosamine formula, suitable for vegetarians, contains only Glucosamine from a vegetarian source. MSN (Methylsulfonylmethane) – 1.0 grams. Other ingredients include cellulose Stearic Acid (vegetable source), Magnesium Stearate (vegetable source) and Silica. Specific amounts of these last ingredients are not contained in the product source Supplement Facts section. 2 capsules daily on a empty stomach. The product is available in a 120 capsule bottle or a 60 day supply at 2 capsules a day and can be purchased thorough the source website for $21.99 excluding shipping charges. Shipping charges can be found in the product vendor’s website policies section. The product can also be purchased through a network of dealers. The product source contains a tool to locate dealers in a particular area. The product vendor has a step by step product return policy described on their website (see the product source). It contains some restrictions and does not contain an estimate of when a customer can expect a refund. This product is moderately priced. Dosage and contents are detailed in the product source. The vendor has a return policy that is outlined on their website and has a contact number customers can call to ask questions. 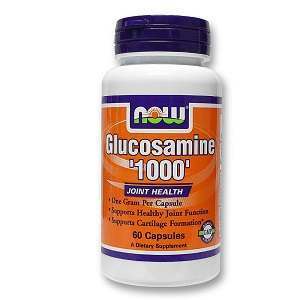 Mark Stevens	reviewed NOW Glucosamine	on July 27th	 and gave it a rating of 2.5.